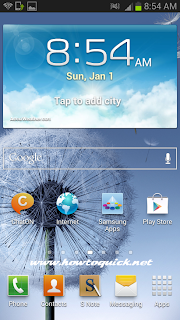 If you're new with your Samsung Galaxy Note 2 LTE smartphone and couldn't figure out how to manage your mobile network settings we will give you tips and guide how to play around with its connectivity. In this post we are using GT-N7105 version of Note II and mostly the same with N7100, this is LTE capable device running on Jellybean 4.1.2 Android OS powered by a quad core CPU. It has one micro SIM slot for cellular or wireless connect data, messaging and voice services. Most mobile users nowadays rely on mobile network in accessing to the internet and other online services. 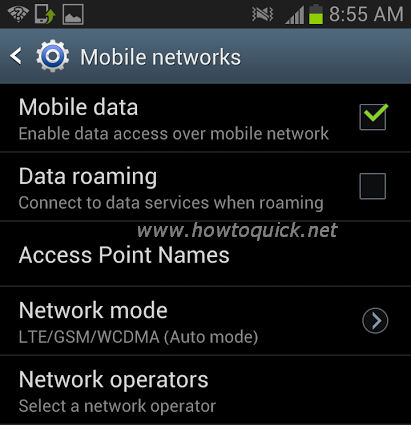 By default cellular settings is already configured once you insert you provider SIM on your Samsung Galaxy Note 2 and prompted you which to choose from postpaid or prepaid account. 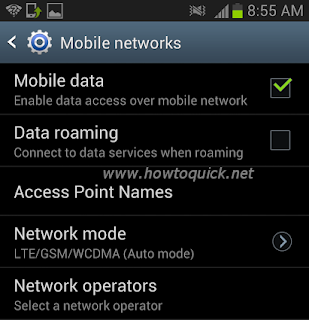 Some other network SIM cannot handle well in terms of selecting type of account on your mobile especially when you are trying to change your current SIM to other network new SIM card. In this case, we need the assistance of our network provider to configure the settings for us but if you are willing to configure it by yourself, you can do that also. 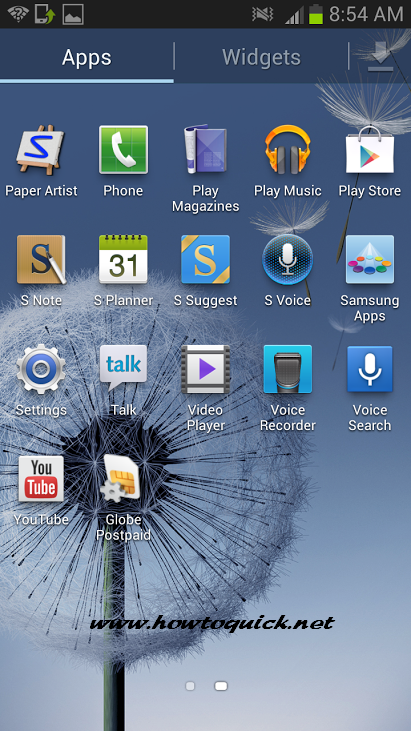 Just follow this work through guide on configuring Samsung Galaxy Note 2 LTE, 3G, GPRS and HSDPA internet settings of your network. Go to Settings then tap on More settings. In Wireless and networks menu, select Mobile networks. Make sure that Mobile data is marked with checked. 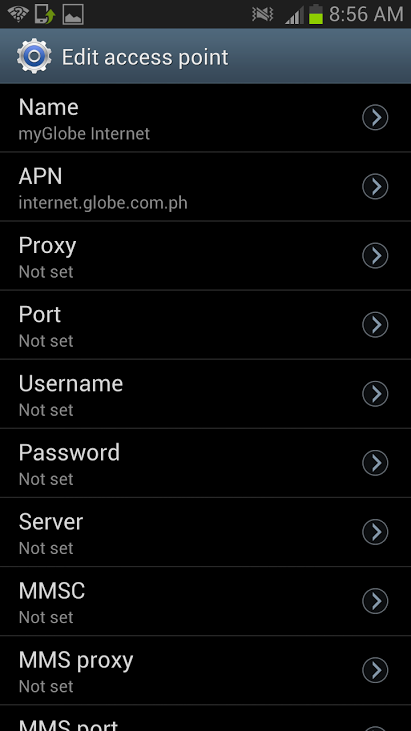 Once done selecting th APN, click back button then look and tap Network mode. 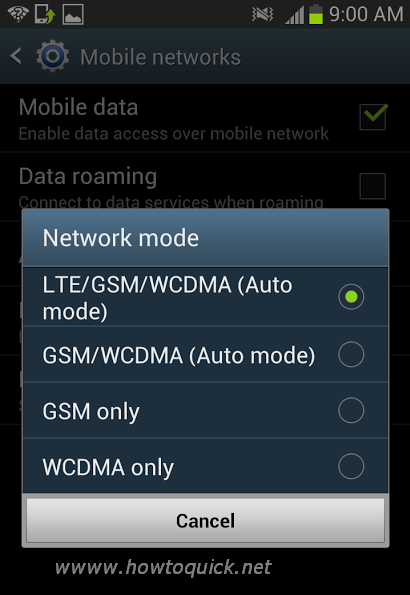 If your network has LTE on your select LTE /GSM/WCDM (Auto mode), for you to benefit the fast LTE speed of your network. Back to your home screen and test if your connection is already active, if you find 4G/3G/H+ icon beside your phone signal bar that means your mobile data is already active. To make sure if it already working go to your browser and try accessing any site and see if it load the page. The process is almost the with above steps, when you reached step no. 5 all you have to do is tap the Option button and choose New APN. From there, you have to define the APN, Name, Proxy, Port, MCC, MNC, Authentication, APN type and data bearer. You may find sample details on screenshot below. 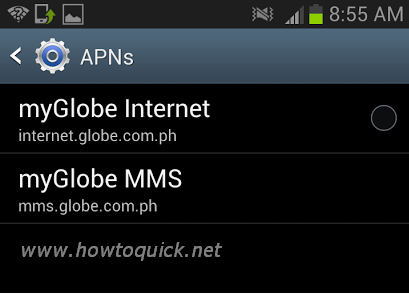 Data use above is for Globe Telecom, you can use you networks (Smart, Sun, TM) APN deetails in here. You can tap downward the top most of the Samsung Galaxy Note2 home screen where time, battery, Wi-Fi icon are located to activate and deactivate network mobile services quickly. Other connectivity features of Note 2 LTE are Wi-Fi, Bluetooth, GPS, NFC, DLNA, Wi-Fi Direct and Wi-Fi hotspot tethering. 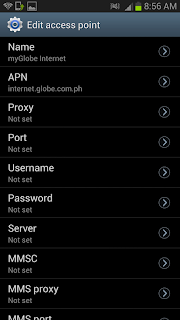 You can also configure this device to use VPN by inputting your VPN credentials and correct network settings. If also allows you sync file to your Cloud storage, just use Wi-Fi or mobile networks when using this services and this may cost additional data charges in your not enrolled to any unlimited internet plan.